It's long been an argument of the fossil fuel industry and its flacks that driving an electric car is worse than a gasoline or diesel or even natural gas-powered version because most of our electricity comes from coal. Now that's patently untrue and becoming more so with each passing decade, but it's also a left-handed slap in the face of the very industry they supposedly are trying to support. See how dirty your coal-powered electric car is compared to our "clean" diesel? Whoever drew up the cartoon and/or commissioned some poor starving freelancer to draw it, is either ignorant of the latest findings on total EV emissions or is determined to lie to the public. But even a lying picture is still worth a 1000 words, so rather than explain the latest scientific findings, I decided to look at the underlying premise of the cartoon: one diesel car produces fewer emissions than one powered by an enormous fossil fuel plant. Since the origins of the tweet, if not the illustration, appears to be the Netherlands, I decided to see what would happen if we accepted the artist's premise. I chose the 1600MW Dutch coal-fired power plant at Eemshaven in the extreme north of the country - one of a dwindling breed, since most of Hollands thermal plants now run on natural gas and/or are biofuel fired. The Dutch plan to decommission or convert all their remaining thermal electric coal plants by 2030. Assuming the Eemshaven plant operates 24/7 330 days out of the year (which is the utility average), it will produce, theoretically (not accounting for transmission line losses and charging system inefficiencies, of course), a staggering 12.7 billion kilowatt hours annually. How many electric cars would that plant power if it were devoted exclusively to EVs only as the cartoonist seems to imply? The rule of thumb I use is 1kWh can propel the average electric car approximately 3 miles. Google informs me that the average Dutchman drives the equivalent of 8,264 miles yearly. They bicycle most of the rest of the time, which I greatly admire. So, if my math is correct (and please double check me) the Eemshaven coal-fired power plant would generate enough electrical power annually to propel 4,646,864 electric cars around Holland: not just one as the cartoon not so subtly implies. 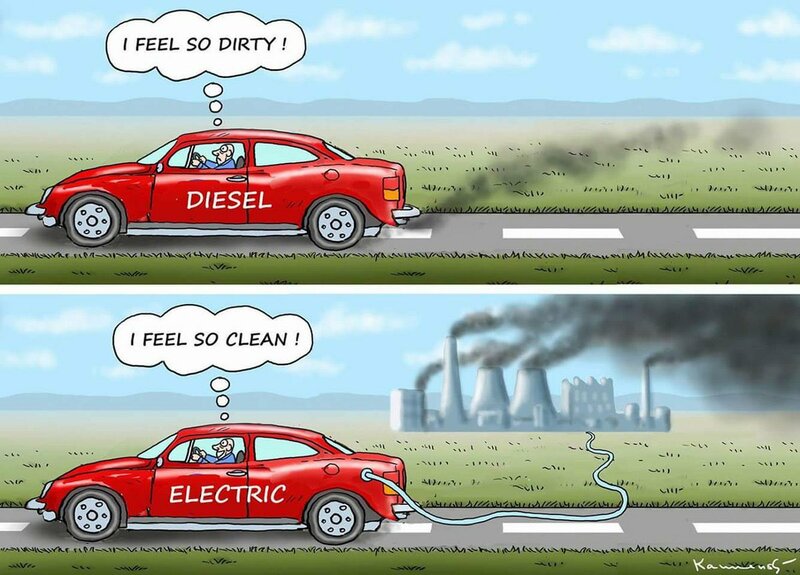 Now because electric cars are, as a generalization, at least twice as energy efficient as even a diesel car, for the cartoon to be a more accurate illustration, the artist would have to show the emissions from 9.29 million diesel automobiles if you want to accurately compare the two energy systems. What the cartoon doesn't say is that while the Dutch are dependent on coal for about 15% of their generation, 61% is now provided by marginally cleaner and less CO2 intensive natural gas. 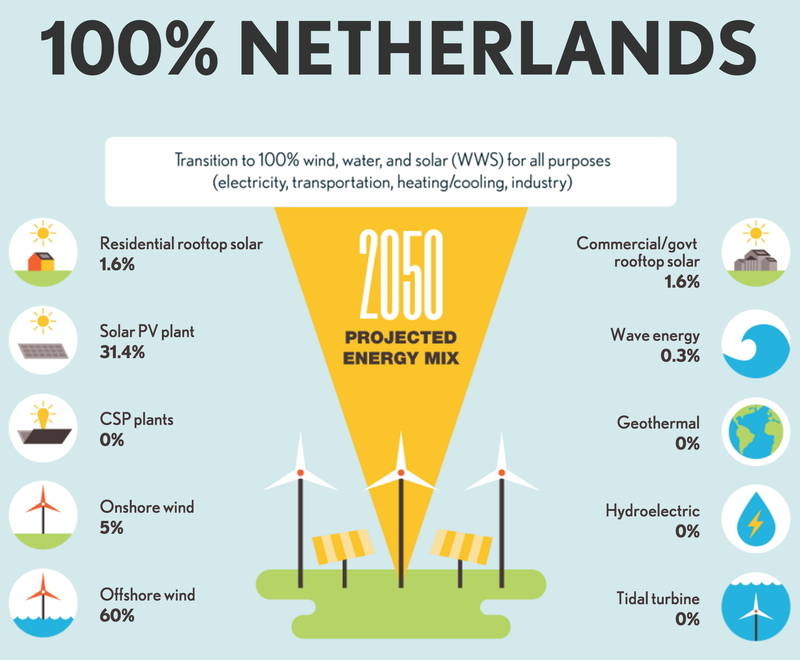 Offshore wind, solar and biomass are contributing larger shares of the country's energy mix [See Do the Netherlands’ trains really run on 100% wind power?] and as the illustration below highlights, the country has plans to wean itself completely away from dependence on fossil fuels. While the cartoon is amusing, it's also grossly misleading, and my guess is, it was promulgated by the usual suspects of fossil fuel pimps more interested in corporate bottom lines and feathering their fouled nests than the welfare of the Dutch people, who need we be reminded live in a country where rising sea levels are going to make life there tenuous, indeed.